Planting daffodils is one of my favourite jobs, though it is tinged with a bit of sadness that summer is now truly over. So planting these sunny yellow flowers is a good way of looking forward to the spring. When I had my very first garden I planted loads of daffodils and had a wonderful display the first year. I congratulated myself that all my hard work was worth it because now I would have a fantastic display for years to come. The second year however I had loads of foliage but just a few flowers. I learned that I had not planted my bulbs deep enough…classic novice error! Bulbs which are too close to the soil surface are subject to drought as soon as the sun begins to shine. They simply don’t get enough moisture or sustenance. It’s the leaves, which remain after the flowers, that pass food to the bulbs as they die back, so the bulbs can store enough nutrients to produce flowers again the following year. 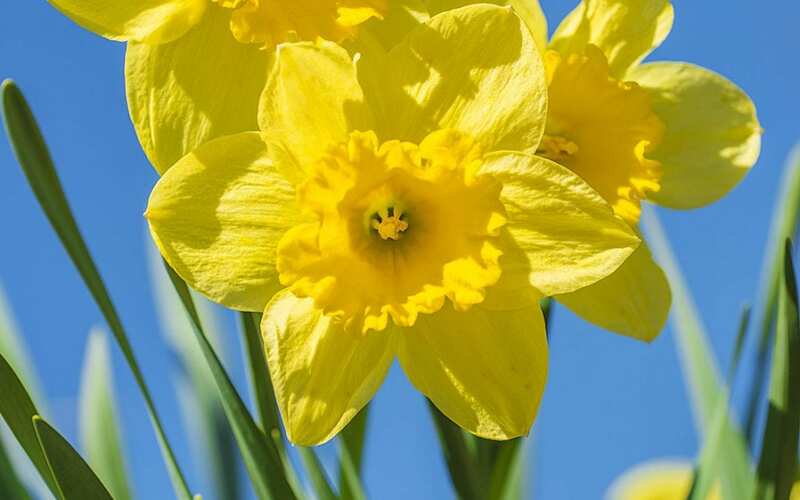 Daffodil bulbs need to be planted at least 15cm / 6 inches deep, and don’t cut the foliage back after the flowers have died for at least 6 weeks (another novice error!). In order to produce the best possible display the following year, once the foliage has faded sprinkle some general fertiliser around the plants. When planting for the first time, clumps look best in the average suburban garden. I plant eight to ten bulbs in a round group spaced about 8cm / 3 inches apart. I dig a hole wide and deep enough to accommodate the whole group, firm the earth back into place and (really important) label the spot! That way I avoid spearing the bulbs when I’m digging while they are dormant. If you want early flowers then go for short stems as they survive frost better. The bright yellow ‘Tête-à-tête’ is the perfect partner for late snowdrops. I love ‘Jenny’, which has pale yellow trumpets that gradually fade to white, and ‘Trevithian’ which is a lovely yellow and quite graceful. ‘Thalia’ and ‘Pipit’ are both good later-flowering daffs, and I have a soft spot for ‘Hawera’, which is a soft yellow and multi-headed. The latter looks amazing in a blue pot underplanted with white Pulmonaria angustifolia ‘Sissinghurst White’. Now it’s your turn to spring into action. © 2019 Prestwich & Whitefield Local Ltd. All rights reserved.